Many pet lovers choose to take their furry companions along during a holiday. While their intentions are undoubtedly sound, countless accidents and injuries occur every year as the result of not knowing what rules to follow while driving. 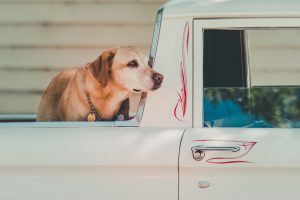 The safety of a pet in a car should never be taken for granted and there are a handful of factors which must be addressed so that unfortunate circumstances can be avoided. It should first be mentioned that the National Highway Code has outlined specific guidelines that need to be applied when travelling with a pet. However, the most important is to realise that pets such as dogs and cats need to be “suitably restrained”. This includes methods such as a seat belt for larger animals and a carrying cage for smaller varieties (1). Please note that there are several seat belt attachments which can be purchased for this requirement. These restraints will not only keep your dog safe, but prevent them from falling and injuring you or another passenger in the vehicle in the event of an emergency stop. Although breaking these rules might not result in a direct traffic infraction, you could still receive a fine of up to £2,500 pounds for “driving without due care”. Other prohibitions include allowing a dog’s head to hang outside of the window and not using the appropriate cage to keep an animal safe. There are several steps to take in order to safety transport man’s best friend from place to place. We should first note that the temperament of the animal needs to be taken into account. Extremely jumpy or excitable dogs are better to secure in the rear of the vehicle in order to avoid distractions while driving. Once again, this can be accomplished by using a seat belt or the appropriate carrying cage. If you happen to have a puppy, it can feel more secure if you provide it with its favourite toy before the journey begins. Many experts also recommend the use of a dog barrier so that the animal is not able to jump into the front seating area (2). Should you own a larger animal (such as a German shepherd or a golden retriever), provide it with ample room to move around while travelling. Keep the windows cracked in order to provide extra air circulation. Take frequent breaks so that your pet can go to the bathroom. Bring along treats and toys that can act as distractions. Don’t leave your dog in a hot car. However hot it is outside, it’s going to be even hotter inside that vehicle after a matter of minutes. Keep an eye out for any signals that the animal may be dehydrated or otherwise uncomfortable. Common symptoms include panting, a dry tongue, extreme lethargy or abnormal irritability. It is best to pull over and to allow your pet to drink plenty of water before proceeding. It is important to know the safest way to transport a dog in a car and all of these suggestions will prove invaluable. Taking the appropriate steps in advance will ensure that your pet can make the most out of its journey!